Did you know that black skinned horses which includes grays need more copper than others at all times? Bays and chestnuts will look washed out with lighter-colored than normal coats, and the blacks will have a definite reddish cast. Horses need copper in their diets to properly utilize iron and to develop healthy connective tissue. It is also important for horses with allergies as it is able to lower the concentration of histamine in the body. Copper also helps to keep the central nervous system running correctly. In adult horses a deficiency of copper in the diet may cause limb deformities, thinning of the bones, swelling of the joints, blood vessel weakness, connective tissue weakness, saggy skin, and a lowered immune system as copper is the main mineral for the body to produce T cells. It is also important for bone integrity, heart health, skin pigmentation and to prevent premature graying. A copper deficiency can also lead to anemia. If there is an excess of iron in your soil or water it will create a copper deficiency. 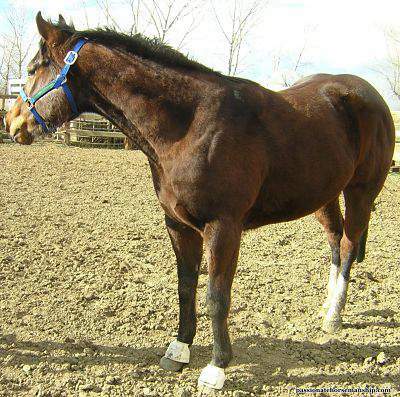 If the horse is experiencing a copper deficiency, they are probably deficient in other nutrients. If I have a horse that is showing any of these signs I immediately put them on SOD from Dynamite Specialty Products. I don’t recommend adding SOD with other products as you could create an overload or imbalance of vitamins and minerals. I prefer to use SOD from Dynamite because they use pure chelated copper in this supplement, which is in the same form it would be in a whole food. By using chelated copper you bypass any potential of toxicity from the minerals not being able to be flushed out if the body does not need them. It is important to buy premium products that use chelated minerals and not inorganic minerals. Inorganic minerals are difficult for the horse’s digestive system to utilize. Chelating or attaching the mineral to a form of protein (amino acids) makes the mineral more available. Look for copper proteinate or copper amino acid chelate on the feed tag. If feeding a lot of copper you may also need to include a little more zinc in the diet occasionally for balance as good nutrition is all about keeping a balance. If your horse has a shiny coat that feels great or they have a body full of dapples you probably don’t have anything to worry about. Going into spring when the horses are shedding their winter coats they will look icky as the coat is dying and shedding out. Also keep in mind that if you have horses that you’re working hard and their sweating, the salts from the sweat will often bleach the coat. If you rinse them with well water it has a lot of minerals in it which will also bleach the coat color. I also use this product if I plan on having a stallion gelded or I plan on traveling the SOD will boost their immune system. If you want to add SOD to your horse’s diet or you have questions contact me to set up a FREE consultation. Hello, I live in Queensland, Australia. I have heard that you can feed Copper Sulphate to address Copper Deficiencies in horses. Is this correct in your opinion ,? Hi, Rosanne! I’ve not personally given Copper Sulphate. For a copper deficiency, I recommend SOD from Dynamite Specialty Products. I own three horses two new one born and raised on my farm.I live about four miles for an old zinc plant that’s been shut down last two years a company has been excavating contaminated soil.one of the new horses I got is a gaited made three yrs old and lately I’ve noticed her gate looks stiff hard to tell about her coat due to it being winter but she eats n drinks fine my other two horse one born on farm gelding 8yrs old and a 3 yr old mini horse stud colt they both seem fine. I was thinking it mite have something to do with the zinc in the soil any suggestions?? Hi I am interested in a safer inclusions of copper into my horses diet as they are showing signs of deficiency such as lighter coats. Where can I perhaps purchase SOD in Australia – hopefully where it does not cost a motsa! Thanks for the question Virginia. I’m not sure where you would get SOD (aka Superoxide dismutase) in Australia. I always get mine from Dynamite Specialty Products because of the purity and it works. If you want I could see what shipping to Australia would cost. My name is Rose and I’m from British Columbia, Canada. I have been researching copper deficiency in horses as our two eventers are ‘low’ (as per blood panel). They are also almost always ‘high’ in iron on the same tests. We have had the water tested and it is ok so I’m assuming it’s the soil around here. I’ve been trying to find a good copper supplement that does NOT include iron but this is proving difficult! Both horses are bay and shiny/dappled but I still worry as they seem to be prone to abscesses, although the terrain is very rough and rocky and they do rip around on it. My vet doesn’t seem concerned with the low copper/high iron but I really would like to supplement. Sounds like it could be the soil in your area. I use a product called SOD from Dynamite if I have one that is low in copper and as an added benefit the SOD will help in building the immune system. Take a look at the product it may work for your horses. You can find it by going to my distributor website at https://www.dynamitespecialty.com/kimwende. When you get to the site click on Equine and you will find the SOD. If I can be of further assistance please let me know I’m happy to help.